So for any of you that may have seen on my Channel Mum Halloween video – I made some yummy pumpkin and cream cheese muffins. They’re sugar and dairy (if you don’t add the cream cheese) free so they’re a great alternative to the tonnes of sweets, cakes and chocolates available this Halloween! Preheat your oven to 180C and put your muffin cases in a muffin tray. (Wet Ingredients) – Empty your pumpkin puree into a large mixing bowl, add your almond milk, your 2 eggs, the dates (blitz them in a blender or chop very finely) and the pure vanilla extract. Then mix until smooth & put to one side. (Topping) – In a small bowl, add all of the ingredients for the topping, give them a good mix until they’re all combined and set aside too. (Filling) – In an even smaller bowl (you’ll be using a few bowls with this recipe haha! ), add your cream cheese and 2tbsp of maple syrup – give it a good stir. (Dry Ingredients) – Add your flour, pumpkin spice, baking powder, baking soda and salt into another bowl; mix well and then add to the wet ingredients. Give it all a good mix but don’t overmix, otherwise the muffins won’t rise too well in the oven. Spoon into the muffin cases and make a well in the middle of each one with a fork. Then add your cream cheese filling and topping! Voila! 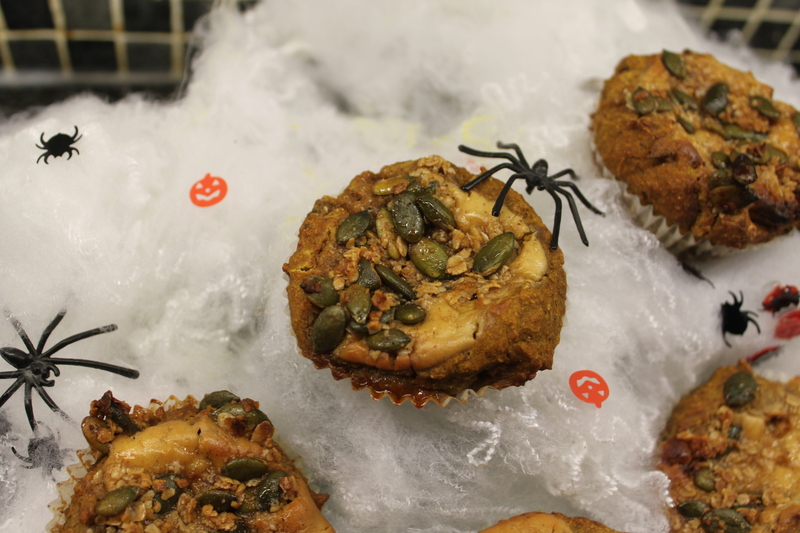 Scrummy, healthy pumpkin-y muffins! If you have any questions don’t hesitate to ask me! Also, if you do decide to make these – upload a photo using the hashtag #CMHalloween so I can check them out! Happy Halloween and Happy Baking! Previous postMy Cosy Autumnal Essentials! Next postMy Stairgate Attacked Me! !